Flickers: The Rhode Island International Film Festival in a special collaboration with the Consulat Général de France à Boston will present “The Shortest Day” (Le jour le plus court) on Saturday, December 20th. Flickers will showcase the "Ciné-Francophone" program at Rochambeau Library in Providence, Rhode Island. This will be the only presentation of Le Jour Le Plus Court in the Americas. Saturday’s screening will be free to the general public and will feature a dynamic collection of short films from the French-speaking world. “The Shortest Day” (Le jour le plus court) is a global French film festival organized by the Department of Short Films, L’Agence du Court Métrage, a French organization dedicated to championing the art of the short film. “The Shortest Day” (Le jour le plus court) will take place on the weekend of the Winter Solstice, a fitting time to celebrate the art of the short film, and promote its artistic merit worldwide. As part of this unique international event, Flickers will screen six celebrated French language short films representing diverse aspects of the French speaking world. These films represent France, Canada, Belgium, and Burkina Faso. The titles are: “Hsu Ji Behind the Screen,” directed by Thomas Rio, 2012; “Bernard Le Grand,” directed by Marie-Hélène Viens and Philippe Lupien, 2013; “Jennah,” directed by Meryem Benm’Barek-Aloisi, 2014; “ON/OFF,” directed by Thierry Lorenzi, 2013; “Je suis une actrice,” directed by Benoit Lach, 2014; and “Twaaga,” directed by Cedric Ido, 2013. Screenings are free and open to the general public! Join us for a special monthly series from the Flickers Rhode Island International Film Festival that presents some of the best films screened during the 2014 Festival. This month we rediscover an amazing and powerful program of short films that were screened at RIIFF this past August. As always, the JAC program this month is one not to miss! A Global Village (8 min.) Directed by Ezra Millstein. Jeffrey DeChausse From USA & India. A family in India and from the USA work together to build a new home and a cross cultural understanding results. Families are Forever (20 min.) Directed by Vivian Kleiman. La Grand Disillusion (10 min.) Directed by Pedro Gonzalez Kuhn. From Spain. In September 2012 the Spanish government increased the culture tax from 8 to 21% which caused the closing of many theaters, an effect felt equally by those cinemas forced to convert to digital technology. Life After Manson (25 min.) Directed by Olivia Klaus. Crooked Candy (7 min.) Directed by Andrew Rodgers. While Kinder Surprise chocolate eggs are hugely popular around the world, they are illegal in the United States due to a quirk in the FDA regulations. One fan of the eggs has smuggled them across the Canadian border for years despite being caught by the border patrol. Showfolk (24 min.) Directed by Ned McNeilage. For seven Hollywood golden era veterans with a combined age of 662, all of whom reside at the Motyion Picture and Television Fund home, the show goes on. From a Vaudeville comedian still working at 100 to the stunning siren who dated Reagan when he was a Democrat, these ladies and gentleman are Showfolk through and through, with indomitable spirit and entertaining memories. FLICKERS: Rhode Island International Film Festival (RIIFF) is proud to present its Fall edition of the annual Roving Eye International Film Festival™. The popular and acclaimed festival celebrating global cinema and artists, announces its 2014 sidebar program on the Jewish Experience through short films, documentary, media and guest speakers. By the time jazz violinist Aaron Weinstein came on the scene, jazz had been kicked to the curb of popular culture. So when legendary entertainment agent, Mel Howard offered to work with Aaron, the young violinist eagerly signed a long-term deal with the veteran agent. Unfortunately, Mel's golden touch has rusted with age. Pablo, an Argentinean, travels to Rome to find his grandfather, of whom he has only got a painting and a poem. During his stay in Rome he will discover his true origins. A Jewish boy, nurturing a secret romance with a Muslim girl despite the realities of their backgrounds, is unaware that he is being stalked. While the young lovers struggle to be open about their relationship, the stalker's obsession reveals a thought provoking turn culminating in the trio coming face to face. No Love Lost is an intriguing tale of love, obsession and unyielding prejudice. During World War II, Josy was about to be executed by a Nazi soldier with a group of Jewish people, but he had the key for survival. Now, as an old man, he is tormented by the guilt of survival, and he must face his memory before leaving this world. Max is on the road with his pregnant girlfriend Lina. He suddenly gets a call from his grandfather who wants to meet him shortly before he will be taken away. At the grandfather's home he offers Max an inheritance that blasts apart any notion of 'family'. In North London there's a small orthodox Jewish hotel. You don't have to get circumcised to get a room, but why would anyone from his own will would have a Kosher breakfast. Iris, the receptionist, has taken this job aside to her documentary studies. She represents more or less the opposite of the typical clientele. If they knew more about her carefree lifestyle, the bible would probably slip from their hands. Far from Israel, with its political and social tension she's started to have intimate and open conversations with Hassidic Jews for the first time. 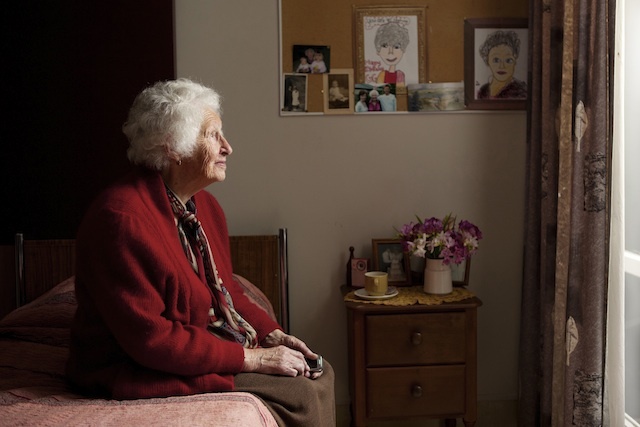 She documented her conversation in order to open a window to this closed mysterious community. The personal cross-cultural documentary captures, in a quirky humorous way, the conservative Jewish orthodox world. On September 24, 2012, at the direction of Secretary of State Hillary Clinton, Deputy Secretary William Burns, issued the first ever apology to the surviving passengers of the Jewish refugee ship, SS St Louis. The St. Louis left the Hamburg, Germany on May 13, 1939, bound for Havana, Cuba, and seeking refuge from Nazi tyranny. Upon arriving in Havana in late May 1939, the passengers were refused entry into Cuba. The captain of the luxury liner, Gustav Schroeder, turned northward and steered the vessel to within sight of the Miami coastline where he and the passengers formally pleaded with President Franklin D. Roosevelt and the State Department to grant them safe harbor and freedom from the Nazi web of terror. The US refused and the ship was forced to return to Europe where many of the passengers perished in the Auschwitz death camp. The story became a symbol of America and Canada's indifference to the plight of the Jews suffering under Hitler. The documentary explores the political backstory of why Roosevelt and Secretary of State Cordell Hull refused to grant safe harbor to the passengers thus giving them a death sentence when they returned to Europe. The documentary incorporates segments of the State Department ceremony including scenes from The Trial of Franklin D. Roosevelt. The film also includes archival footage of the ship's voyage as well as never before seen interviews with the surviving passengers of the SS St Louis and an exclusive interview with Ambassador Stuart Eizenstat. Featuring a discussion with Rev. Nancy Hamlin Soukup, University Multifaith Chaplain, RWU, who has studied the Holocaust as part of her research on religious and refugee movements from 1939 to 1951. Currently, she is completing her study about the Unitarian Service Committee’s work in Europe as a refugee and rescue organization as war commences and later as one of many religious and secular relief organizations throughout Europe after the war. Its founders, the Rev. Waitstill Sharp and Martha Sharp, are only two of three Americans honored among Yad Vashem’s Righteous Among the Nations for saving Jews from the Nazi regime. Rev. Soukup holds an M.A. in human rights history from Boston College and is completing her Doctorate of Ministry at Andover Newton Theological School. When Hitler's infamous "Anschluss" annexed Austria to Germany in 1938, the lives of 130,000 Jewish Austrians were placed at risk. Over the next three years, some 30,000 managed to emigrate to the United States, settling mainly in New York City. In Austrian filmmaker Egon Humer's brilliant and moving documentary EMIGRATION N.Y., twelve Viennese Jews -- seven women, five men -- recount their lives as children in Austria, as emigrants, and as New Yorkers. 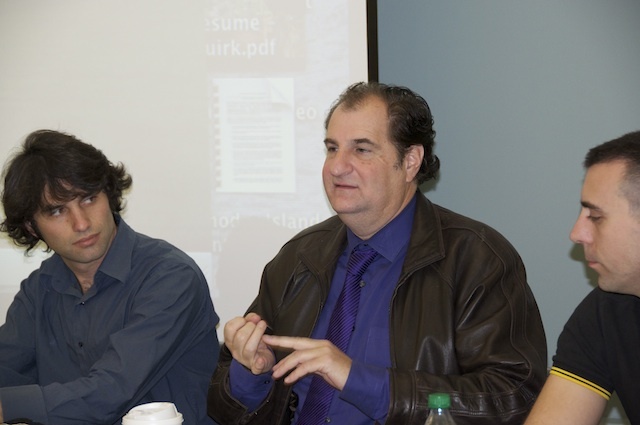 Featuring a conversation with Frank Eisinger, one of the twelve émigrés whose experiences are profiled in the film. 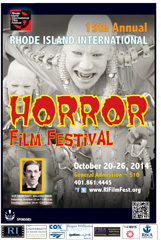 Forum at RWU, 10/23/14 at 10:30 a.m.
2014 Rhode Island International Horror Film Festival Commercial on Vimeo. Chris was born and raised in North Providence, Rhode Island. 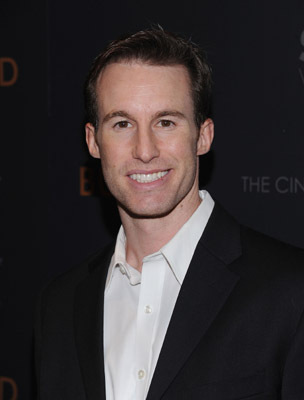 He wrote the 2010 film "Buried" starring Ryan Reynolds, for which he won "Best Original Screenplay" from the National Board of Review of Motion Pictures, as well as a Spanish Academy Award in the same category. His Black List script, ATM, was produced by Gold Circle Films and released by IFC Films in 2012. Chris's feature directing debut, the supernatural thriller " The Atticus Institute," will be released in early 2015. His most recent script, "SEA OF TREES," is slated to be released in 2015, starring Matthew McConaughey and directed by Gus Van Sant. He is currently adapting author Jo Nesbo's bestselling crime novel "Blood on Snow" for Warner Brothers and Leonardo DiCaprio. He has also sold TV projects to F/X, Universal Television, and Fox Television. On Wednesday October 22nd, experience the local legend of Lizzie Borden at The Jamestown Arts Center, 18 Valley Street, Jamestown, RI. 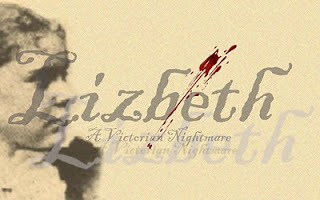 The Festival will screen “Lizbeth: A Victorian Nightmare,” directed by Ric Rebello and after the presentation host a special examination of the film and its subject, often called one of the most infamous crimes in US history. In what should be a "spirited" discussion, the Q&A will feature Lee-Ann Wilbur, the owner of the Lizzie Borden House (Bed and Breakfast), and Stefani Khoori Ph.D., the editor of the Literary Hatchet (A Lizzie Borden Magazine). The evening’s screening will also feature “Fallout,” directed by Derek Dubois (USA), “Serpant's Lullaby,”directed by Patricia Chica (Canada), and the Academy Award-nominated, “Feral,” directed by Daniel Sousa (USA). Panelists: Justin White, “Unearthed and Untold: The Path to Pet Sematary,” Jessica Sonneborn and Erik Latek, “Alice D.,” actor/writer, Tom DeNucci of Woodhaven Productions, Shawn Quirk, RIIFF’s Programming Director and Nick Palermo, President of RWU Film Production Club. Time: The tour will take place this year on two days: Saturday, October 25th at 11:00 a.m. and Sunday, October 26th at 12:00 Noon. Continue your Festival experience with one of our long-term Festival Partner in Canada. It's their 43rd Edition and one not to be missed. The Festival presents daring, one-of-a-kind films from here and abroad, ensuring their success as well as introducing audiences to auteur filmmakers like Atom Egoyan, Marc-André Forcier, Souleymane Cissé, Zacharias Kunuk, Denis Villeneuve, Guy Maddin, Léa Pool, Jim Jarmusch, Jane Campion, Alfonso Cuaron, Wong Kar-wai, Wim Wenders, Mohsen Makhmalbaf and Raymond Depardon. For 43 years now, the Festival du nouveau cinéma has fulfilled its mission with purpose and passion. 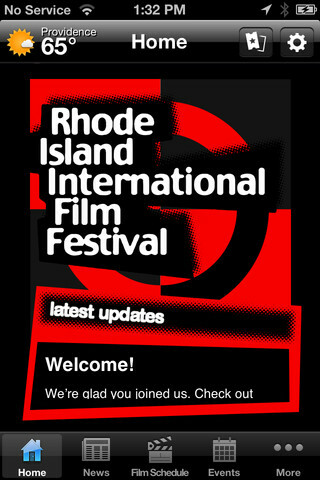 RIIFF is once again pleased to be a partner Festival in the 2014 Online New England Film Festival. The Festival will be live from September 1 through October 15, 2014. This year, 28 filmmakers will have their work online that you can screen and judge and 9 festivals are involved as partners. Look for an incredible range of styles and genres. To see this year's award-winning films, click here. 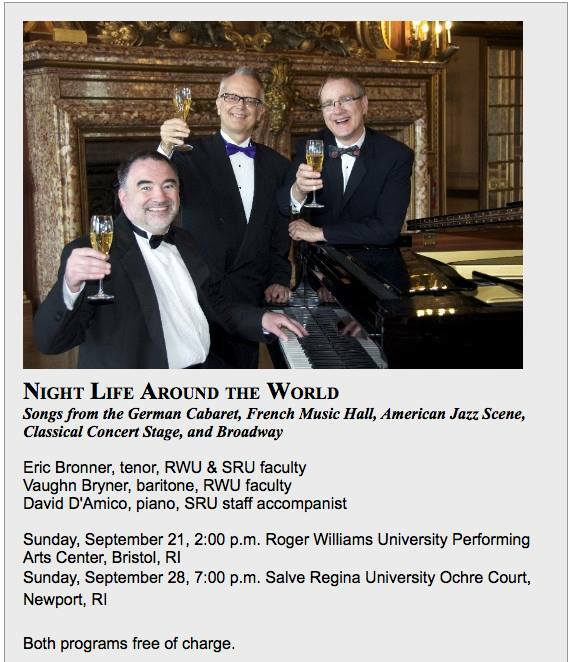 A wonderfully engaging mix of music from across the globe by three very gifted artists: Eric R. Bronner, tenor; Vaughn Bryner, baritone; and David D'Amico, pianist. Two concerts. One down. One left. Amazing music. Free. Not to be missed! Commemorate Lovecraft’s birthday (August 20) with a walking tour that celebrates the author’s Providence stories: "The Thing on the Doorstep” and “The Call of Cthulhu." H.P. 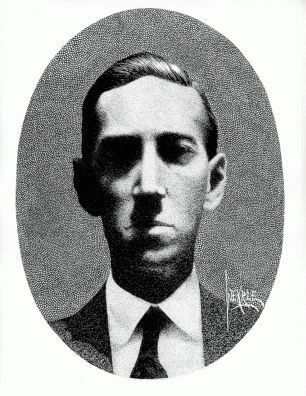 Lovecraft was born in Providence in 1890. His detailed descriptions of his favorite city are amazingly accurate in 2014. 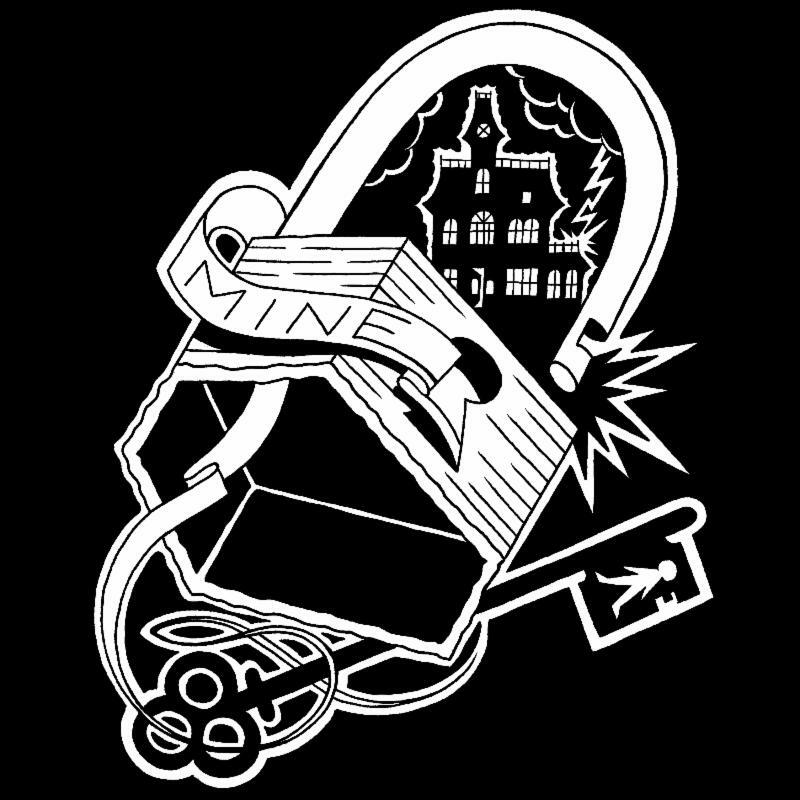 Join our friends at the RI Historical Society for a walking tour which explores the College Hill neighborhood where Lovecraft drew literary inspiration and where he called home. Departs from the John Brown House Museum with post "Readathon" at the Providence Public Library. Space is limited, please RSVP. To RSVP, contact 401-273-7507 x362 or bbarnes@rihs.org. Time: The tour will take place: Saturday, August 23rd at 11:00 a.m. Cost: $10.00 for the Walking Tour. Separate admission for the Lovecraft Readathon at the Providence Public Library. For more information about that element of the celebration, click here. The SIGGRAPH conference and exhibition is a five-day interdisciplinary educational experience in the field of computer graphics and interactive techniques. 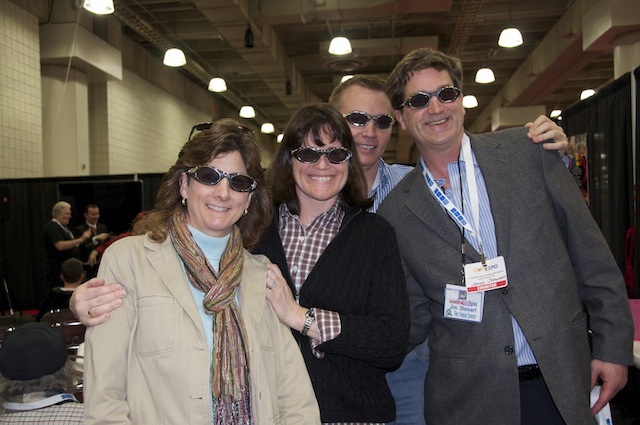 It includes a three-day commercial exhibition that attracts hundreds of exhibitors and attendees from around the world. The conference hosts the international SIGGRAPH Computer Animation Festival, showcasing works from the world's most innovative and accomplished digital film and video creators. Under the Computer Animation Festival, Daytime Select Theater is a daylong animation & short film show presenting fresh, provocative, and exciting curated themed content, Monday - Wednesday. Since SIGGRAPH deals mostly in computer animation (2D/3D), VFX, and emerging tech, screening the film work from RIIFF in live action short film will provide an oppoprtunity to bring the genre to the conference. The Flickers: Rhode Island International Film Festival (RIIFF) runs August 5-10th at venues in Providence, Bristol, Jamestown, Woonsocket and across the state of Rhode Island. 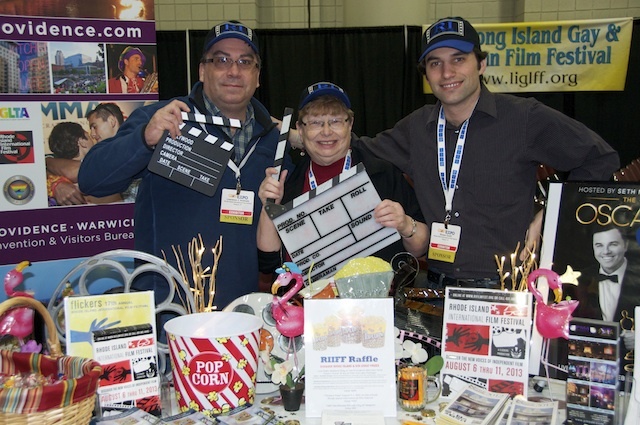 Screening 200+ films, it is the largest film festival in New England and every year attracts more than 5,300 entries from around the world. More than 200 filmmakers are expected to descend on the state’s capital city this year. RIIFF is a magnet for those who’ve made short films because it is a qualifying event for the short film category of the Academy of Motion Picture Arts and Sciences. In 2013, three of the films that premiered at RIIFF went on to receive Academy Award nominations. Discover an unforgettably memorable selection of short films from around the world and New England that await audiences at the gala opening night of the 18th Annual Flickers. This year’s selection promises to engage, entertain and possibly discover the next Academy Award nominee. As part of it’s long tradition, Flickers will celebrate the “Art of the Short Film” representing an array of genres that salute RIIFF’s unique status: out of more than 7,000 film festivals world wide, the Rhode Island International Film Festival is one of only 19 qualifying Festivals with the Academy of Motion Picture Arts and Sciences—the Oscars––in the narrative and documentary short categories. It is the lone Festival in New England with that distinction. Discover why Providence is truly a Hollywood backlot, learn about its history, and find out about some of our state's most notable and colorful characters. The goal for the tour is to provide filmmakers with an “insider’s” view of the downcity and riverwalk area with an eye toward what would be interesting/unanticipated places for filming. Since it began 16 years ago, KidsEye™, created by FLICKERS: Rhode Island International Film Festival (RIIFF) has celebrated the most exceptional work of young video makers by showcasing their projects. Rhode Island’s premiere showcase of cinematic work focused on young people has become a popular festival-within-a festival, featuring guest speakers, discussions, dance parties, concerts, and a "Youth Open Screen." Those attending KidsEye™ will be able to meet youth video makers and their mentors; see a diverse collection of youthproduced media. On Saturday, be sure to join us for the premiere work of the students from our annual KidsEye™ Summer Filmmaking Camp. What does it take to make successful films without breaking the bank? Learn firsthand from Tom DeNucci of Rhode Island-based Woodhaven Productions in a revealing workshop that will open your eyes and inspire. His is a true success story and illustrates that yes, you can make a career in this field and not live in Los Angeles, or any other major film hub. It's a revealing and valuable conversation that you should attend. The Rhode Island film company recently secured a deal with Screen Media Films and Universal Studios to produce 10 new motion pictures – including the thriller “Almost Mercy,” currently in pre-production – for on-demand video release reaching more than 100 million households. Cost: Free. Registration Requested. Get your eticket below. Director/Professor Jonathan Pope Evans comes from Chapman University in Orange, California where he works closely with actors, from coaching/directing them in films Sepulte "The Buried" and "Hoover Road"(screening at RIIFF this year) to coaching actors in art of screen acting. Evans challenges actors to develop the self, to personally connect to the moments in a scene, and to experience a very personal and profound physical awakening within the world of the character. In this workshop, Evans explores various exercises for developing characters, including substitutions and emotional triggering based in the work of Larry Moss, Ivana Chubbuck and Lee Strasberg. Whether you are a film actor looking for new tools for your process or a director looking to guide actors to create emotional and personal performances in your films, join Director/Professor Jonathan Pope Evans for an informative journey into the acting process. The Workshop will take place on Wednesday August 6th and will run from 2:00 p.m. to 5:00 p.m.
Here’s your chance to become involved with Rhode Island and New England’s “Stars” of the film industry. The popular one-day forum brings together leaders of the film community with decision-makers in education, marketing, politics and media in the region. This year’s Forum will also address what's new on the technical side of the business and how you fit in! SCRIPTBIZ 2014 • SOLD OUT! workshop that covers the nuts and bolts of being a scriptwriter. 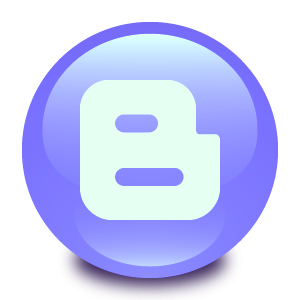 The program is broken down into two parts: introductory and advanced. The Flickers’ ScriptBiz Program is designed to guide writers not only through the creative process of writing, but ways to promote a screenplay to filmmakers through effective networking with tips on how to make a compelling pitch. The Pell Center at Salve Regina University's Story in the Public Square program has partnered with the Rhode Island International Film Festival for an afternoon of cinematic storytelling featuring the documentaries, “The War Photographers” and “The Newport Effect” on Saturday, August 9th at the Jane Pickens Theatre, 47 Touro Street in historic downtown Newport, R.I. The afternoon begins with “The War Photographers,” which recounts the personal experiences of award-winning photojournalists who risk their lives covering conflict in the world’s most dangerous war zones, past and present, including Vietnam, Iraq, Afghanistan, Somalia, Sudan and the Middle East. The following film screening, “The Newport Effect,” chronicles the history of the legendary Newport Folk Festival and its profound impact on the world of folk music and social activism. What better way to celebrate the City by the Sea's 375th Birthday! Infamous as the place where Bob Dylan 'went electric' in 1965, the reach of the festival goes far beyond that iconic moment. “The Newport Effect” is narrated by Joan Armatrading and features segment narrations by artists who have played the Newport Folk Festival — Rosanne Cash, Michael Doucet, Steve Earle, Angelique Kidjo, Pokey LaFarge, Tom Morello, Mavis Staples and Lucinda Willimas. The afternoon will include discussion and appearances by the filmmakers. SIPS director G. Wayne Miller, a writer and documentary filmmaker, will serve as moderator. A special Festival collaboration linking artistic events that take place in the city of Providence on Saturday, August 9th as a way to introduce not just Festival audiences, but visiting filmmakers, to the rich culture and arts programming of the capital city. Special tickets have been arranged with Opera Providence for its performance of “The Mikado,” at the Columbus Theatre, 270 Broadway, http://www.operaprovidence.org/. Audiences are encouraged not only to take in premiere film work, but to savor Waterfire, enjoy the sounds of AS220’s Foo Fest, take in the RISD Museum and to close the evening out at the Dark Lady, 124 Snow Street for the Festival’s annual Block Party where they can mingle with visiting filmmakers. 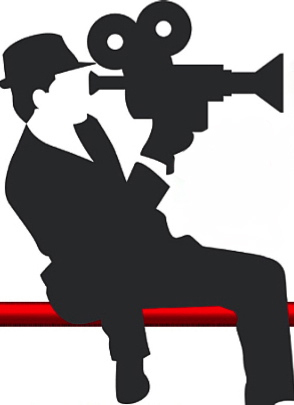 KidsEye™ Summer Filmmaking Camp: SOLD OUT! KidsEye™ is a fun yet intensive five-day filmmaking camp for children ages 8-17 presented by FLICKERS: Rhode Island International Film Festival™. Over the course of the last 16 years, the camp has expanded, allowing children to learn more about what it takes to make a movie. We strive to incorporate as much hands-on learning as possible, therefore placing our focus primarily on production. KidsEye™ participants step into the roles of screenwriters, actors, directors and crew, and learn the importance of working as a team. To learn more, please click here. Please note that we limited the number of campers to 50 insuring the best possible experience and student to teacher ratio. Join us for a special monthly series from the Flickers Rhode Island International Film Festival that presents some of the best films screened during the 2013 festival. This month we rediscover an amazing and powerful program of short films that were screened at RIIFF last August. As always, the JAC program this month is one not to miss! No Tiene Gracia (Not Funny) (15 min.) Directed by Carlos Violade. From Spain. Manolo and Marie are in love and live together. Manolo likes to play practical jokes, and Maria has a lot of patience and a good sense of humor. However, Manolo doesn't quite realize the importance of considering the consequences of his jokes. Son Indochine (9 min.) Directed by Bruno Collett. From Vietman. Animated. An older Vietnamese man recalls memories of the American war. A grand prize best animation winner of the 2013 RIIFF. 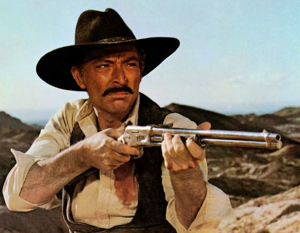 We are very pleased to partner with the Harrington School of Communication and Media to support a weekend seminar on teaching the Western film. The event is being held in collaboration with the Film Foundation, a nonprofit organization established by Martin Scorsese in 1990 that preserves and showcases motion picture history. The Story of Movies, created by the Film Foundation, is a free curriculum and innovative set of teaching resources that helps students appreciate film as an artistic and cultural medium. It’s got a great focus on visual and media literacy – these are fundamental skills that are relevant to students of all ages. Watch this 6 minute video to learn more about the curriculum. Anyone who loves movie Westerns will enjoy this program. The program has been specifically designed by the Film Foundation for educators and teacher-librarians in Grades 5 – 12 with an interest in English and History, who will find this a valuable professional development experience that gives you the knowledge, texts and tools needed to incorporate engaging and meaningful media literacy activities into the curriculum. The program is also ideal for anyone with an interest in learning more about the Western genre or about best practices in film education. This event features several film screenings offering an engaging co-curricular learning experience for undergraduate students enrolled in a Summer course. PARKING: No pass required in the Briar Lane lot. The gate off of Briar Lane between the URI Police and Kingston pizza will be open. Cost: $10 donation; $8 for RIIFF CinemaRI members. Tickets available at the door. The Rhode Island Film and Television Office, in conjunction with the Rhode Island State Council on the Arts Education Program, the Rhode Island Film and TV Office, the Flickers: Rhode Island International Film Festival, the RI Film Collaborative, the RI Arts Learning Network, and the Harrington School of Communications and Media, announces the fourth annual "Give Me Five" youth film showcase on Saturday, May 17th, 2014. The Call for Entries Application deadline is Monday, April 28th at 5:00 p.m. It can be downloaded by clicking here. Teen filmmakers from around Rhode Island will showcase and discuss their 5-minute(or less) films, and receive feedback from a professional panel. Last year, featured films were selected from students at: Beacon Charter School (Woonsocket), Bishop Hendricken High School (Warwick), Everett Company (Providence), LaSalle Academy (Providence), Metropolitan Career & Technical Center (Providence), Portsmouth High School, Trinity Academy for the Performing Arts (Providence), and Westerly High School. The Discontentment of Ed Telfair (18 min.) Directed by Daniel Campbell. Ed Telfair lives a mundane, simple life, dealing calmly with the insecurities of life until he decides to take matters into his own hands. La Hora Senalada (High Noon) (18 m.) Directed by Ivan Mazza. Two boys are taunted into a noontime fight by the chanting of their classmates. As the clock ticks closer to noon, young Figueroa’s fears increase as he grapples between fight or flight options. Snack Attack (5 min.) Directed by Andrew Cadelago. From USA and Canada. An older woman waiting for the train to arrive is increasingly annoyed by a young punk who is helping himself to her package of cookies. 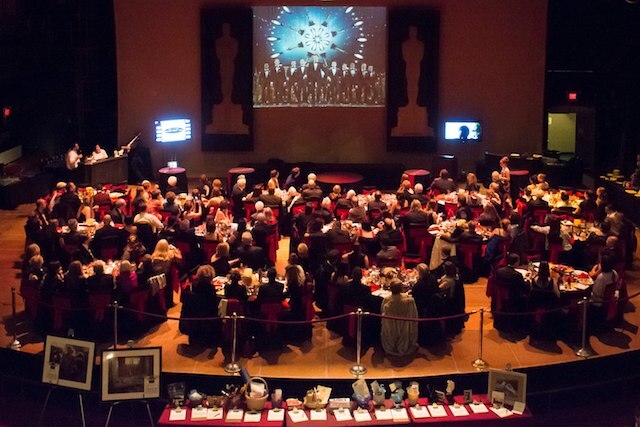 At this year's smash hit event on Sunday, March 2nd, the Red Carpet Experience: Providence, thrilled attendees at the sell-out event learned first-had who were the winners of 86th Academy Awards. “The Lady in Number 6: Music Saved My Life,” Malcolm Clarke and Nicholas Reed (Documentary Short), won Best Documentary Short; which was screened at RIIFF. Additionally, Rhode Island's own Jennifer Lee won for Best Animated Film, Disney's "Frozen." (The film also picked up a "Best Original Song" Oscar® for "Let It Go." Our sincere congratulations to all the winners. What an evening and what memories! The Bicycle (7 minutes) Directed by Adam Neustadter and Chris McCoy. An old abandoned bicycle learns to love again after numerous mishaps. Rescue (6 min.) Directed by Po Chou Chi. Animated. From USA & Taiwan. A group of scientist race against the clock as they undertake a special rescue mission. FLICKERS: Rhode Island International Film Festival (RIIFF) is proud to present its ninth annual Roving Eye International Film Festival™. The popular and acclaimed festival celebrates the film arts from across the globe. All programming is curated by RWU students from current entries to RIIFF. Along with shorts and documentaries, this year's Festival will feature guest speakers and panels, plus animation, Latin-American, Asian and student film sidebars. All screenings, unless otherwise noted, will be free and open to the public . Screenings will take place at the Global Heritage Hall and the Mary Tefft White Cultural Center on the campus of Roger Williams University in Bristol, RI. Images have been used to tell stories since long before the written word. Cave artists provide the first evidence of prehistoric storytelling. Today, images continue to inform, inspire, challenge and shape public understanding, whether they are in print, or shown on film, or streamed on the Internet. 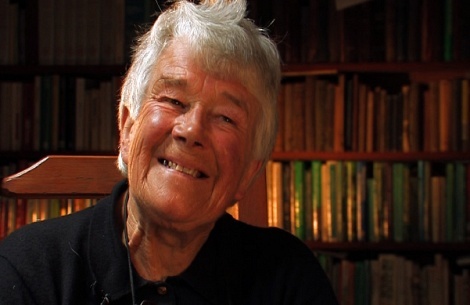 Story Day 2014 will examine moving images - animation, feature documentary and television, as well as short documentary and video. In addition to interactive panels with accomplished storytellers, Story Day 2014 will also feature the presentation of the Pell Center Prize for Story in the Public Square to Emmy-winning screenwriter, producer, and actor Danny Strong, whose screenwriting credits include Recount, Game Change, Lee Daniels’ The Butler, and Mockingjay, the two-part Hunger Games finale, set for release later this year and in 2015. Time: 9:00 a.m. - 9:30 p.m. The Tournées French Film Festival will present six new important French feature films, (all with English subtitles), along with a selection of shorts films that FLICKERS: Rhode Island International Film Festival will premiere from its partnership with UNIIFRANCE that will precede each feature. Wryly philosophical, beautifully drawn, and meticulously detailed, this animated film based on co-director Joann Sfar’s popular comic-book series takes place during the ‘20s and ’30s in Algiers, where said cat is preparing for his bar mitzvah. Having previously devoured his master’s parrot, the remarkable, if hairless and giant-eared, feline at the center of the film now has the power of speech, which he uses, as a devout soul should, to constantly question and probe his faith during his and his master’s voyage to Ethiopia. A staggering, profound examination of love, Michael Haneke’s compassionate film centers on Georges and Anne, long-married octogenarians and retired music teachers who still take great delight in each other. As Anne grows increasingly debilitated both mentally and physically, however, their bonds will be tested. In depicting the struggle to maintain dignity during the unremitting cruelties of aging, Amour brilliantly discusses the greatest crucible of life’s final chapter: figuring out how to best honor the past. Writer-director Philippe Falardeau’s unforgettable movie, based on a one-person play by Evelyne de la Chenelière, explores the intricate process by which M. Lazhar earns the respect and trust of his pupils; some, the children of immigrants or, like this devoted instructor, recent arrivals to Quebec. As the reasons for M. Lazhar’s immigration to Canada from Algeria are made clear, so, too is his rather unconventional method for applying for the teaching position. Monsieur Lazhar is that rarest of movies about education, one that avoids clichés and sentimentality, favoring instead honesty and clear-eyed compassion. Anne Fontaine’s thoughtful exploration of the pre-fame life of the world’s greatest fashion designer focuses on Coco Chanel during the Belle Epoque. The film opens in 1893 with a powerfully grim scene of 10-year-old Coco and her sister unceremoniously dumped at an orphanage and ends around World War I, a few years before the Chanel empire is launched. The Consulates of France, Haiti, Switzerland/swissnex Boston, the Quebec Government Office and the French Cultural Center Boston, are pleased to present "le moi de francophonie" a series of French speaking films (with English subtitles) celebrating the Month of French Cultures 2014. * Each feature selection will be preceded by a short film curated by Flickers. Help us Create this Year's "Providence Jewish Film Festival"
Every year the Festival receives thousands of film submissions. Last year, just over 5,000 films were entered in and out of competition to RIIFF. Of these entries, several hundred deal with themes of interest to the Jewish community. How do we select those titles that screen the Festival and sidebars during the year? Come to the Jewish Alliance of Greater Rhode Island and find out. At our "You Be The Judge" Nights, attendees see the latest work we've received and have a voice in shaping our selections. It's great fun, an evening of discovery and introduces you to a great community of folks who love films! La Francofête est l’occasion de célébrer la langue française dans toute la francophonie. What better way to the celebrate the successful conclusion celebrating a month of Francophonie than with a memorable gourmet meal, unforgettable entertainment by Magnolia and, of course, amazing people. Francofête is presented by Alliance Française de Providence and the League of Francophone Organizations of RI (of which Flickers/RIIFF is a member). We are very pleased to support this wonderful Festival and the amazing young filmmakers it has discovered. BSFF Screening and Awards Party. Watch the films of BSFF 14 and see who wins Best of the Fest! 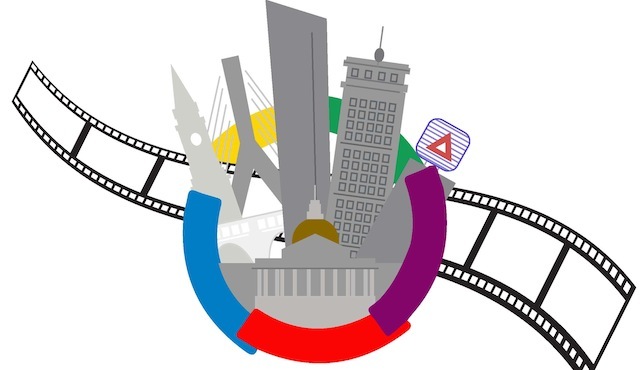 The Boston Student Film Fest is produced by the Boston Student Arts Network (BSAN) and showcases the talented works of New England students. The Fest fills a void in a community where thousands of students reside and produce spectacular work. Their inaugural online event in 2012 proved to be very successful and attracted thousands of visits from students and the public. That year, BSFF showcased 12 films in a variety of genres on their website over a 3 week span. Throughout this period, viewers voted on their favorites for audience awards and the jury of Boston-area film professionals provided their feedback for Best of the Fest awards. 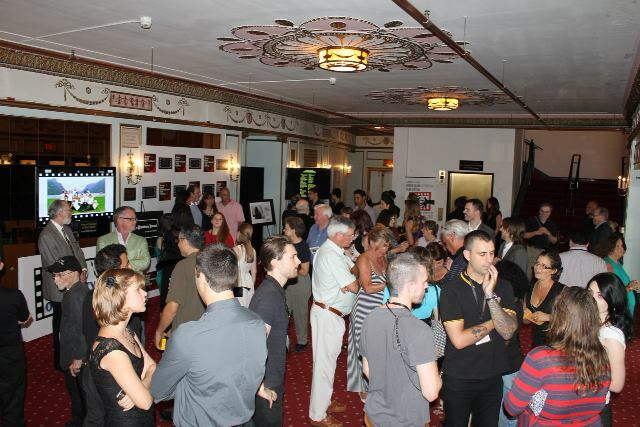 From this Fest, many of the filmmakers went on to showcase their films in Film Festivals around the country. Join BSFF for the signature screening of the Boston Student Film Fest 2014 featuring the top student films of the year. Celebrate alongside asipiring filmmakers as they see their films screened for the public for the first time. Also, learn about their process and inspiration in an exclusive Q&A. All screening ticket purchases include admission to Awards Party immediately following the screening. Screening: 6:30 pm Bright Family Screening Room, Paramount Center, Emerson College, 559 Washington St, Boston, MA. Cost: $10 / $5.00 student discount. Order Tickets Here. Awards Party to follow at Courtyard Boston Downtown. Ticket Required. In 2003, the festival inaugurated the annual IFFB Awards, offering filmmakers awards in four categories: Best Film Best Documentary Best Short Fiction/Animation Director’s Choice. The IFFB Awards also include the annual Excellence Award, which honors those filmmakers whose work brings the very best of Ireland and the Irish to audiences around the world. This year's festival will showcase an award-winning lineup of over thirty Irish feature films, shorts and documentaries. You don't want to miss this unique opportunity to experience the very best of contemporary Irish cinema. Tickets on sale now. Stephen Flynn and James Stewart of Long Island and George T. Marshall of Rhode Island have shared a long history of friendship and collaboration. They have been able to draw in the exceptional talents of Ryan Janek Wolowski (MTV), Neal Bennington (Broadway Pride), Tym Moss and Appolonia Cruz, making for two days of non-stop entertainment. Add to the mix the cinematic vision of emerging visual artists, and it becomes easy to understand the popularity of the Lounge for those attending the Expo. This year RIIFF will be raffling a travel package to the City of Providence (lodging, meals and entertainment) courtesy of our friends at the Providence Warwick Convention and Visitor's Bureau; Gift Certificates to business in the city of Newport, courtesy of the Newport County Chamber of Commerce; and RIIFF Opening Night VIP Passes good for August 5th! Irish Folk Furniture (8 minutes) Directed by Tony Donoghue. From Ireland. Shown at the 2013 Sundance, RIIFF, and Manhattan Short Film festivals. How does one give furniture an anthropomorphic make over? Through this innovative stop motion animated look at the repair and recycling of old Irish furniture and the individuals who oversee their transformation. Shot entirely with natural light. Join us at this wonderful outreach event at the Hyatt Regency on Goat Island in Newport Harbor. We will be introducing this year's new poster design and have our graphics team, led by Michael J. Chevalier, onboard to share some of their work. We will be giving away passes to this year's Festival and even offer a raffle prize of a full Festival Pass. The time for the Expo is 4:00 - 7:00 p.m. EXPO 2014 showcases all that Newport County and the East Bay businesses have to offer. There will be hundreds of fabulous door prizes, plus free samples and souvenirs and live music. Over 100 businesses will be featuring products and services available throughout Newport County and the East Bay. Take advantage of Hassle Free parking and use the Viking Trolley from the FREE parking are at the Gateway Center. The Trolley will run every 15 minutes. Donation: $3.00 • FREE to Chamber members and their employees. Tickets available at the door. In an ongoing partnership -- Délégation of Québec in Boston, Flickers: RI International Film Festival, Alliance Française de Providence and the Museum of Work & Culture -- presents "Cine Quebec," a short series of film with English subtitles, curated and introduced by RIIFF's Program Director, Shawn Quirk. Cocktail Reception followed by the presentation of several Québécois short films with English subtitles. Donation: $10.00 • Tickets are on sale at the Museum and at the Alliance Française contact@afprovidence.org • 401-272-6243 • Tickets are also available at the door. 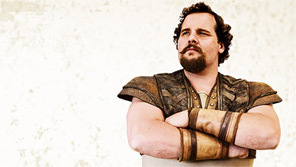 Presentation of a Québécois (2013) Feature Film: Louis Cyr: L’homme le plus fort du monde. In a new collaboration, the Rhode Island International Film Festival and the Ceilidhe Club are proud to host the first Rhode Island Irish Film Feis. Starting at 7PM, the Feis will highlight several shorts and one feature of hand-picked current Irish films. "The Irish Ceilidhe Club of RI has a long and proud history of supporting activities that advance the awareness of Irish culture and history within our community. 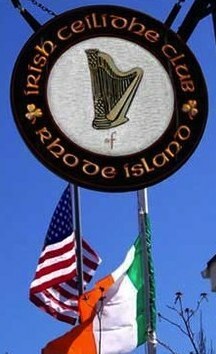 We are delighted to have an opportunity to collaborate with the Rhode Island International Film Festival and welcome members of the public to the Club to enjoy great contemporary Irish films and to participate in this exciting event, " noted Club President Wayne Kezirian. The Red Carpet Experience: Providence is a signature event benefiting the Rhode Island International Film Festival (formerly Oscar Experience and Oscar Night America) for the past 5 years. Guests feel like stars and experience the red carpet, paparazzi, Producer's Circle and Dream Maker Award winners, champagne, gourmet food, speciality drinks -- this year saluting Disney's "Frozen" -- swag bags, silent auction, movie theater tickets and more. The evening kicks off at 6:00 p.m. There is even a pair of homegrown rooting interests this year. Rhode Island’s Jennifer Lee is the writer/co-director of “Frozen,” nominated as best animated film, and RIIFF alum, Daniel Sousa, a professor at Rhode Island School of Design, and Dan Golden, a RISD grad, earned a nomination for “Feral” in the best animated shorts category. 2014 Sponsors: Flickers: Rhode Island International Film Festival, the RI Film and Television Office, WLNE TV6, WSNE, PMA Industries, Dominion Diagnostics, Amtrak, Cabot, Just Ellen's Catering & Event Planning, Decadent Catering, Quality Rental, The Vets, Woodchuck Hard Cider and Newport Storm/Thomas Tew Rum. BEVERLY HILLS, CA – The Academy of Motion Picture Arts and Sciences announced finalists for the 86th Academy Awards on Thursday, January 16, 2014, at 5:30 a.m. PT in the Academy’s Samuel Goldwyn Theater. 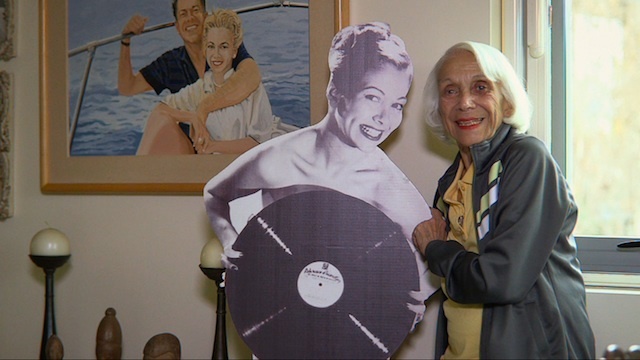 “The Lady in Number 6: Music Saved My Life,” Malcolm Clarke and Nicholas Reed (Documentary Short). UPDATE: We are very saddened that report that Alice Herz-Sommer, believed to be the oldest Holocaust survivor, died at age 110 on Sunday. Herz-Sommer, her husband and her son were sent from Prague in 1943 to a concentration camp in the Czech city of Terezin — Theresienstadt in German — where inmates were allowed to stage concerts in which she frequently starred. An estimated 140,000 Jews were sent to Terezin and 33,430 died there. About 88,000 were moved on to Auschwitz and other death camps, where most of them were killed. Herz-Sommer and her son, Stephan, were among fewer than 20,000 who were freed when the notorious camp was liberated by the Soviet army in May 1945. “The Voorman Problem,” Mark Gill, director, and Baldwin Li, producer (Honlodge Productions) (Narrative Short). Additionally, Rhode Island's own Jennifer Lee was nominated for Best Animated Film, Disney's "Frozen," and RIIFF alum, Daniel Sousa is up for Best Animated Short in "Feral." UPDATE: Disney's "Frozen" just won the BAFTA Award for Best Animated Feature. As of this writing (2/24/14) its international Box Office is at a record $980.4 million. Our sincere congratulations to all the nominees! 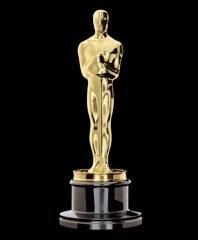 The Academy Awards for outstanding film achievements of 2013 will be presented on Oscar Sunday, March 2, 2014, at the Dolby Theatre® at Hollywood & Highland Center® and televised live on the ABC Television Network. The presentation also will be televised live in more than 225 countries and territories worldwide. Flickers will once again be presenting its 5th annual Red Carpet Experience: Providence on stage at The Vets, celebrating yet another phenomenal year of cinematic discovery. The evening kicks off at 6:00 p.m. This year's event is sponsored by the RI Film and Television Office and WLNE ABC6. Live coverage begins at 5:30 pm.! Get your tickets early as this event sells out! With the Red Carpet Experience: Providence and the 86th Annual Academy Awards just a breathe away, we decided that it would be fun to share some of the brilliant work that has been screened at RIIFF over the past 18 years. These films have gone on to be critically acclaimed, made the Academy shortlist for nominations, or were nominated and in some cases won the coveted award. Of the 33 RIIFF films that have been nominated since 1998, six have gone on to win the coveted Oscar®. From films that evoke, provoke, inspire, entertain and challenge, we will present some of the gems from the RIIFF Vault in a special program that will screen across the state of Rhode Island. All screenings will be free. Plus, we will be sponsoring a raffle where you can win tickets to this summer's Festival and discover the next generation of Academy nominees at our Opening Night Gala (Tuesday, August 5th). Cost: These are all Free Events and presented in collaboration with the RI Film and Television Office. Join us for our special monthly series from the Flickers Rhode Island International Film Festival that presents some of the best films screened during the 2013 festival. This month we rediscover an amazing and powerful program of short films that were screened at RIIFF last August. As always, the JAC program this month is one not to miss! Atlantic Avenue (12 minutes), Directed by Atlantic Avenue (12 min.) Directed by Laure de Clermont. From USA & France. A determined wheelchair-bound seventeen year-old girl encounters love through a young antisocial male prostitute. The Pamplemousse (12 minutes), Directed by Jonathan Watton. From Canada. A First Prize Best Comedy Short winner at the 2013 RIIFF, and opening night selection.. An introverted young female artist and a suicidal man’s paths cross while looking at the Mona Lisa at a special exhibit in Quebec City. Time: 7:00 p.m., preceded by a reception at 5:30 p.m. The Oscar® awards ceremony will be held at the Dolby Theatre in Hollywood on 2 March 2014. 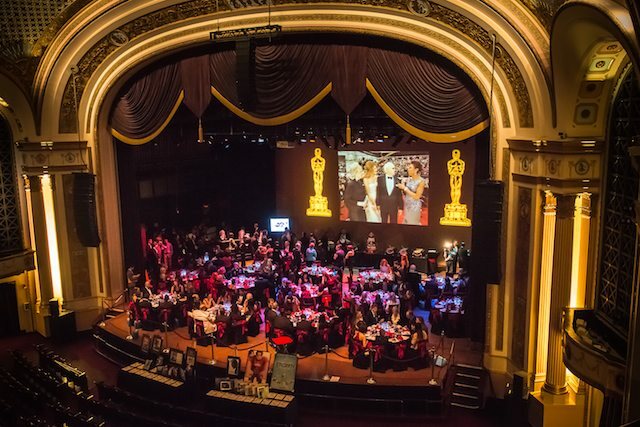 We'll be hosting our annual salute to the Oscars® that evening with the Red Carpet Experience: Providence (see below) sponsored by the RI Film and Television Office and WLNE ABC6. In this short documentary the Rhode Island filmmaker asks for advice from three of the most inspirational people he knows: Steve Connor (luthier & owner of Connor Guitars), Martin Keen (Founder & CEO of Focal Upright Furniture), and Mike Fink (RISD Professor, Author). Every encounter in life is unexpected. A soulless, weightless piece of paper can stimulate coincidences, ignite the collapse but also the rebirth of dreams. The worth of a paper money may seem to depend on its face value. However, in different hands, it may transfer into all kinds of hopes, carrying the pursuit of goals, shifts of desires and emotions. Through the body language of dancers, we leap across the island of Taiwan, taking in the diverse scenery of nature and culture. The journey unfolds with the stream of subconsciousness. For one little girl in soviet controlled Bulgaria, potential manifests itself as music that pours from her heart. Ouverture follows the early life of this particularly peculiar little girl as she learns to overcome, accept, and harness her unusual gift. Animated in a simple but elegant line-based style, it uniquely blends minimalism with a density rarely found in such a seemingly simple story. 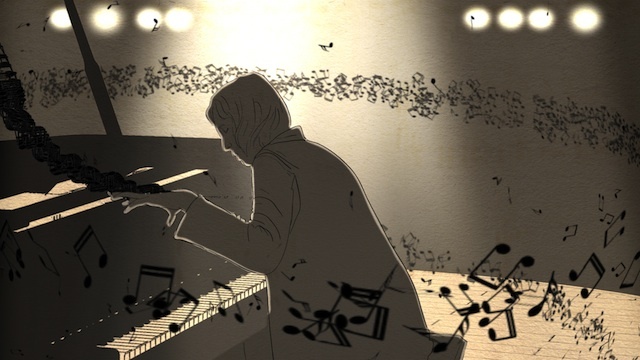 Inspired by, and featuring, the virtuoso Pianist Nadejda Vlaeva, this animated short is set to the classical piece 'Ouverture,' by Johann Sebastian Bach. Sebastian is an 8-year old boy who lives with his grandmother in an ordinary house in an ordinary, monochrome world. But when Sebastian gets on the bike to go for a ride, the adventure into his imagination begins. Sleight of Hand. A set of techniques used by someone to manipulate objects secretly to deceive. This is a stop-motion film about illusions. 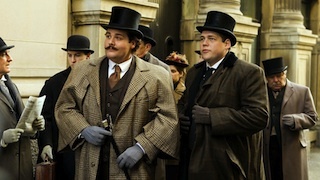 A Man yearns to know his place in the world and how he fits in, when sometimes it's better not to know. The sky's no limit as the author-illustrator of The Dot and Ish winds up his Creatrilogy with a whimsical tale about seeing the world a new way. Marisol loves to paint. So when her teacher asks her to help make a mural for the school library, she can't wait to begin! But how can Marisol make a sky without blue paint? After gazing out the bus window and watching from her porch as day turns into night, she closes her eyes and starts to dream... from the award-winning Peter H. Reynolds comes a gentle, playful reminder that if we keep our hearts open and look beyond the expected, creative inspiration will come. This documentary short explores the groundbreaking collaborations between photographers and recording artists who came together to create some of the most enduring images in rock history. From the early 1950s through the present, 'Who Shot Rock & Roll' tells the stories behind the photos and takes viewers on a visual journey through the many eras of rock and roll. Powerful imagery and insightful commentary give viewers a unique glimpse into photography's impact on the ever-changing-but everlasting-culture of rock and roll. Wonder is a short animated film about finding the fantastic within the mundane. An urban cityscape comes to life as Sage finds wonder through her imagination, transforming her world into one just a little bit stranger as she discovers that adventure is all around her.